Tip: Marinate the lamb with the all the spices and a pinch of salt and pepper then place in the fridge overnight for extra flavour. Hello again foodies! Another cracking dish for you to try out at home this month – A gorgeous Lamb Tagine sure to leave your taste buds tingling! A popular trend at the moment is healthy authentic street food and this recipe ticks all the boxes. 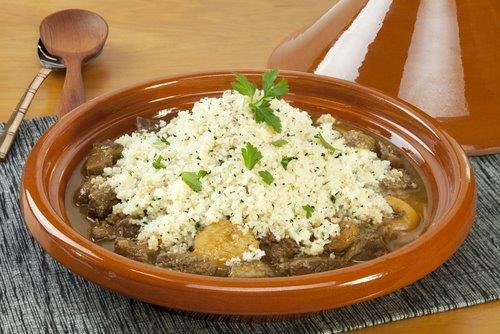 This Lamb Tagine has a wide variety of spices, a wonderful depth in flavour and an amazing aroma. Make sure to have a chat with your local butcher and pick up some good quality lamb – it’ll make all the difference! Preheat the oven to 160C/140C fan. Heat oil in a large heavy pot or casserole dish over medium-high heat. Season lamb with salt and pepper. Working in batches, brown lamb on all sides, about 4 minutes per batch. Transfer lamb to a bowl. Add onion to pot, reduce heat to medium, season with salt and pepper, and sauté until soft and beginning to turn golden, about 5 minutes. Add chopped garlic and ginger for 1-2 minutes, then add the spices. Be careful not to burn spices, as this will result in a bitter sauce. Add the tomatoes and lamb with any accumulated juices. Bring to a boil. Add stock return to a boil, and place the dish in the oven with lid on for 1 ½ hours. Add fresh coriander and parsley and balance out the flavours with honey, sea salt & freshly ground black pepper. Mix the olive oil through the dry couscous – this helps to separate the grains and prevent them from sticking together and ensures a fluffy result. Place the couscous in a large bowl. Bring the stock to the boil and pour over the couscous- cover the bowl with Clingfilm and set aside for 6-8 mins. One of the most important things to do as a chef, whether you’re working as a professional in a restaurant or as a food lover in your kitchen at home, is to keep up with the latest trends and try them out for yourself. As a food manufacturer that is chef led we practice what we preach by keeping our ears to the ground to see what exciting trends are taking place. Don’t be scared to experiment with new ideas and flavours and see if you can put your own twist on some classic dishes. If you would like to find out more about some of the products we currently produce you can download a brochure and please contact a member of the team if you would like any additional information.